A traditional New Orleans frontline of clarinet, trumpet and trombone explores novelty soundtrack music ala Raymond Scott, while bringing fresh ideas to waltzes, ballads, marches and rags. 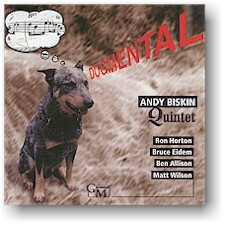 Andy Biskin received a grant from Meet the Composer for a 1999 concert with the Jazz Composers Collective which combined his music and film work. This recording, featuring some of the hottest young leaders in jazz today, showcases his eclectic, sometimes humorous compositional style. "An excellent clarinetist with a light, appealing sound, Biskin writes charming tunes that bring cool jazz into a more contemporary dimension." Ben Allison, bass; Matt Wilson, drums. Also: Andy Eulau, bass; Bruce Hall, drums. Recorded on 14-15 July 1998 at Acoustic Recording, Brooklyn NY, and 17 June 1996 at Hillside Sound Studio in Englewood NJ.